CAIRNS, Australia, Jul 18 2012 (IPS) - The world’s largest and best protected coral reef will be doomed by Australia’s unprecedented scale of planned coal and gas development, experts say. This threat to the Great Barrier Reef is so serious that UNESCO recently announced it may downgrade the reef’s prestigious designation as a World Heritage Site to a “World Heritage Site in Danger”. “That would be a big blow to our tourism industry, which generates nearly six billion dollars a year and employs over 50,000 people,” said Terry Hughes, director of the Centre of Excellence for Coral Reef Studies at James Cook University in Australia on the last day of the 12th International Coral Reef Symposium (ICRS) here in Cairns, Australia. “It’s immoral to keep building new coal mines when we know so much about climate change and its impacts,” Hughes told IPS. Both the state and federal government collect substantial royalties from the mining sector. The Great Barrier Reef is the world’s largest reef system, with 3,000 reefs running 2,300 km along most of the state of Queensland’s coast. Although protected as a marine park for decades, coral cover has declined 50 percent since 1960s due to impacts from land-based pollution including fertiliser and mine runoff, bleaching from warmer waters and outbreaks of crown of thorns starfish that eats coral. Australia is the world’s biggest coal exporter and Queensland is a major mining and export region, shipping 156 million tonnes annually, mostly to Asian markets. Now there are proposals to expand that output sixfold to nearly one billion tonnes annually by 2020. That enormous amount is equivalent to the collective heft of nearly every motor vehicle on the planet – some 800 to 900 million vehicles in all. The carbon footprint from that much coal means another 1.8 billion tonnes of climate-damaging carbon dioxide (CO2) would be added to the atmosphere annually. The world’s best scientists say reductions in emissions of the billions of tonnes of CO2 are needed before 2020 to prevent catastrophic climate change. Climate change has already warmed the oceans 0.5C degrees and made them 25 to 30 percent more acidic, impacting the health of reefs around the world. That will only worsen with every tonne of coal burned. All of those tonnes of coal dug from the Queensland outback are loaded on huge coal ships that have to navigate through or around the Great Barrier Reef. India’s Adani Group recently announced it will spend six billion dollars to build Queensland’s biggest coal mine in the state’s central region, including a new town and a runway for fly-in, fly-out workers. It will also build a 350 km railway to connect to new port facilities on the coast to ship some 60 million tonnes a year back to India. Other Indian miners, along with a number of Chinese mining interests, have locked up an estimated 20 billion tonnes of coal resources in central Queensland. Australian mining companies are also expanding their operations. Existing coal ports will need major expansions and new ports have been proposed up and down the Queensland coast. The number of coal ships needed to move all that coal is projected to jump from the present 1,700 to more than 10,000 by 2020. In 2010, the coal ship “Shen Neng” took a short cut and ran aground on the reef, leaving a three-km scar, an oil spill and trail of toxins from its anti-fouling paint. Clean-up costs for such accidents could top 100 million dollars and it would be difficult to get shipping companies registered in foreign countries to pay the costs, officials told IPS. Coal may be king in Queensland, but liquefied natural gas (LNG) is the big new player. In fact, Australia is home to more than 70 percent of LNG projects in the world. Tens of billions of dollars are being invested in hundreds of drilling sites, including hydraulic fracturing operations to tap the extensive deposits of coal-seam gas (also known as coal-bed methane). Delivering the gas for exports means new pipelines and giant processing plants to turn the methane into LNG for shipping on special ships with high-pressure tanks to Japan, Korea and other Asian markets. Gas also has a big carbon footprint. IPS reported earlier this year that U.S. scientific studies show that coal-seam gas can have higher CO2 emissions than coal when emissions from mining, transmission and burning is included. Four LNG processing plants with port facilities have been proposed at the rapidly expanding coal port of Gladstone in central Queensland. 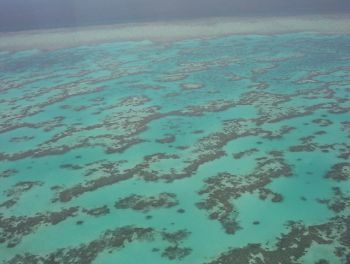 Extensive dredging is already underway and Australia’s minister of the environment has approved the ocean dumping of millions of tonnes of dredged material inside the Great Barrier Reef Marine Park boundaries, Hughes said. Even without the dumping, satellite images have shown dredging sediment, including toxic metals, drifting up to 35 kilometres out to sea. Mass fish kills have been recently been reported in the area and commercial fishers are blaming it on the dredging activity. Duongs, sea turtles, dolphins and other marine species are not doing well south of Cook Town, where most of the coastal development has occurred so far, said Alana Grech, a researcher at James Cook University. New ports and industrial development would have a negative impact, especially if done in the relatively pristine north, Grech told IPS. The cumulative affects of development, pollution, shipping and climate change are very worrying, said Laurence McCook, science co-ordinator of the Great Barrier Reef Marine Park Authority, which has a mandate to manage and protect the reef. To date no cumulative impact assessment has ever been done. That was one of the main criticisms UNESCO made, McCook said. Until now, the potential impacts of each LNG terminal, coal mine and port expansion proposal has been only examined in isolation without ever considering the cumulative impacts. Some of these have already received government approvals to proceed. Australia is now doing a “strategic assessment” to determine the potential cumulative impacts of new and proposed development and comply with UNESCO’s request that this should be done before any new development. The assessment is expected to be completed by 2014. “If we can’t protect the reefs here in Australia, who can protect reefs anywhere?” said McCourt.